JERUSALEM — Prime Minister Benjamin Netanyahu’s apparent election victory has deepened the divisions in an already-divided country. Just two weeks ago, Davidi’s town was dealing with around-the-clock air raid sirens as Palestinian militants in the neighboring Gaza Strip were bombarding southern Israeli communities with rocket fire. It’s a scene the residents of southern Israel have gotten used to since the Hamas militant group seized power in Gaza 12 years ago. It’s also a constant source of frustration. Residents complained about Netanyahu’s inability to stop the rockets and were furious over his latest behind-the-scenes cease-fire deal with Hamas. But given a chance to change things in Tuesday’s election, residents of Sderot voted overwhelmingly for Netanyahu’s Likud party and its religious and nationalist allies. In Sderot, whose population is largely working class, religious and of Mizrahi, or Middle Eastern, descent, Netanyahu’s Likud received 44% of the vote, compared with 9% for the rival Blue and White party, according to official election data. More than 80% of Sderot voted for Likud and its religions and nationalist allies. In contrast, Blue and White, led by former military chief Benny Gantz, coasted to victory in Tel Aviv, the country’s prosperous commercial and cultural center, as well as the nearby suburbs that are home to a more professional and affluent population. In contrast, the 69-year-old Netanyahu, facing the strong likelihood of criminal charges in the coming months, sounded very much like his friend President Donald Trump. He frequently portrayed himself as the victim of a “witch hunt” and accused Gantz of conspiring with politicians from the country’s Arab minority to topple him. Even after a decade in office, Netanyahu marketed himself as the outsider. Gantz’s rally looked like a celebration. Netanyahu’s felt like a sporting event, with the whipped-up crowd whooping and hollering as if it were at a soccer match. Where Gantz’s supporters were excited, Netanyahu’s supporters — many wearing Jewish skullcaps and dancing to Mizrahi pop music — were ecstatic. His speech included a Jewish prayer and a Trump-like swipe at the “hostile” media. 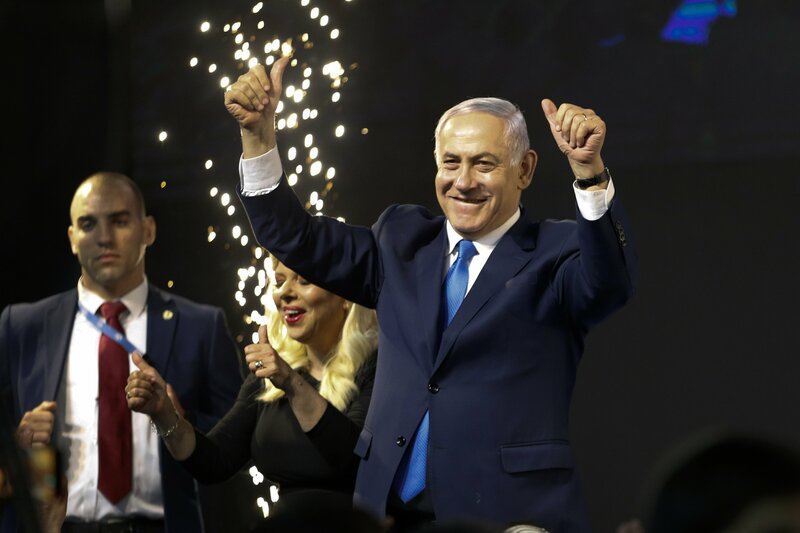 Netanyahu’s opponents finally conceded defeat Wednesday, acknowledging that he and his traditional allies control a solid majority in the 120-seat parliament. Thanks to Netanyahu’s legal woes, these smaller partners have some added leverage. They will likely use Netanyahu’s fear of indictment to their advantage as he seeks promises to protect him from prosecutors, perhaps by pushing legislation granting him immunity. Netanyahu veered sharply to the right on the campaign trail to shore up support of his base, promising to begin annexing West Bank settlements if re-elected. Netanyahu’s allies will try to hold him at his word. “The new Netanyahu government will have two main goals: to get rid of the indictments looming in his future and to annex the settlements to Israel, in coordination with the Trump administration. These two goals could be summed up as ‘immunity in exchange for sovereignty,’” wrote Aluf Benn, editor of the Haaretz daily. Ben-Dror Yemini, a columnist for the Yediot Ahronot daily, urged Netanyahu to consider a “unity” government with Gantz instead of caving in to the “extortion” of small hard-line parties. “Which is the better choice: to save the country or to sanctimoniously insist that ‘promises must be kept?’” he wrote.